We offer a one stop experience for all of your business copier, computer, and telephone system’s needs. We are a family owned business specializing in copiers, computers, telephone sales, repairs, rentals, leasing, and service. We offer copier maintenance contracts to a large list of clients across Palm Beach, Broward, and Miami-Dade Counties. 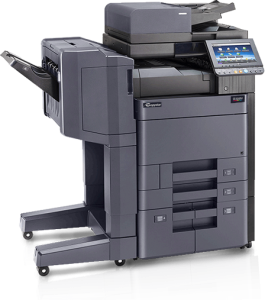 We specialize in Kyocera, Copystar, and Ricoh copiers. If you are in the market for a new copier contact the experts at STAT. We specialize in analyzing your business and pairing it with a copier that will help you save on printing costs each month. 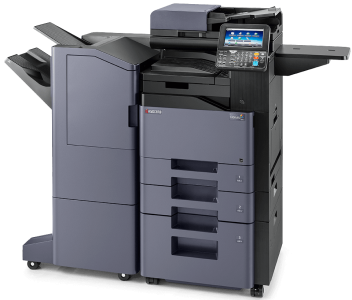 Our trained technicians repair Kyocera, Copystar, Ricoh, Lanier, and HP Printers and Copiers. We carry most parts in stock for these major brands resulting in faster repair services for our customers. Did you know that regular copier servicing can avoid costly repairs and save you money every month on your printing costs? The factory trained technicians at STAT Business Systems are experts at optimizing your current copier/printer to ensure optimal performance. Interested in keeping up to date with copier technology? 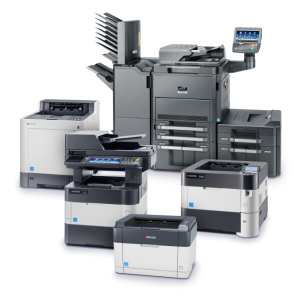 Our copier leasing program is designed to provide new copier equipment every few years so you always have the latest equipment. We offer extremely competitive rates and transparent contracts as part of our honest approach. STAT offers short term and long term rentals for our customers with an affordable monthly rate. Our fleet of rental machines are thoroughly tested to ensure optimum performance and reliability. Fast copier delivery allows you to get up and running quickly. 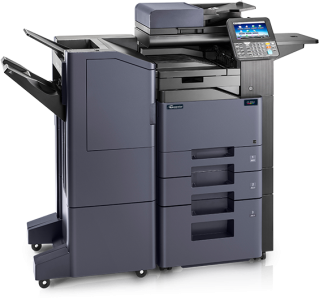 In addition to our copier service, we offer reduced service rates through our maintenance contracts for Kyocera and Copystar branded copiers. Our copier maintenance program is perfect for busy business owners who do not want to worry about their copier not working. Many different equipment leasing companies do not have the manufacturer relationships that we have built over the years. We choose our office copy machine brands based on these relationships to ensure that our customers receive the best possible customer service and after sales care. When you enter into a copy machine leasing program you will be working with the sales company for a couple of years at a minimum. It's important that you choose a company that excels in copy machine service. STAT Business is the right choice to get a great machine and receive some of the best after sales support and care in the South Florida area! Although there are many copy machine companies in Florida it is rare to find one that has been in business as long as STAT Business Systems. Our copy machines for sale often go for lower prices than the big companies due to our long term relationships, volume, and commitment to fair consumer value. We offer a low monthly payment through our copy machine lease program that include copy machine service. We also offer financing and direct purchase options for the best flexibility. Want to try it before you buy? Why not try renting copier machine products from us first? The bottom line is that when you work with STAT Business Systems you will be more than satisfied! Trust the leader in copier and printer solutions in South Florida. Have a look at just a few of the testimonials we have received below. Become our next STATisfied customer with a free quote! We have built a strong reputation in South Florida by focusing on the highest level of customer service paired with the latest cutting edge printers and copiers available. Our hands-on approach allows us to provide extremely fast service for all of your copier, computer, and telephone needs. We also provide a number of additional services that help your business operate efficiently and effectively. Most of our team has been with the company for over 10 years. This is primarily because they understand the value in a company who puts customers first. Copier Machines Fort Lauderdale: Our team is ready to provide you with a copier machine to fit your Fort Lauderdale company’s needs. 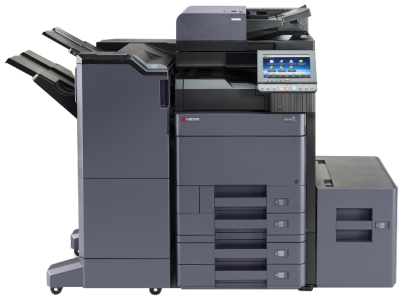 Our knowledgeable staff can offer you a top of the line Kyocera machine that will awe you in its efficient performance. 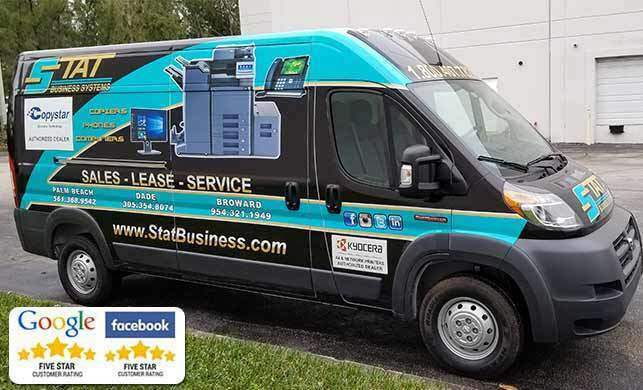 STAT clients enjoy a peace of mind whether they are located in Miami, Fort Lauderdale or Palm Beach as STAT offers maintenance packages so that everything except the paper is taken care of allowing your company to take your focus off of the copier and back onto business. If you have a choice of a Fort Lauderdale company guiding you to a machine for your copier needs, choose STAT to see what our clients are talking about. As part of our dedication to customer service, we offer a free printing and copier consultation for your business. We will present you with options that will help to reduce printing costs while providing copiers and printers that are easy to use. Our systems are designed to make copying and printing more efficient. Copy Machines Palm Beach: STAT has been the South Florida leader of Copy Machines in Palm Beach, Broward & Miami-Dade counties for over 20 years. Our competent staff and service technicians’ main goals are to provide their clients with a positive experience while matching them with copy machines that fit their daily needs. Copiers Boca Raton: STAT provides outstanding service to many small and large business copiers in Boca Raton. There is no business too large or small for our sales team. 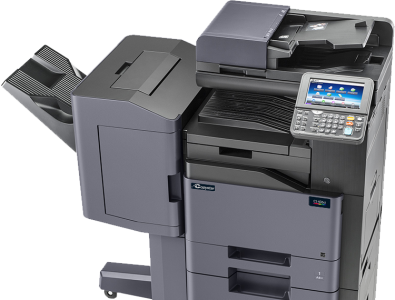 We carry only top of the line Kyocera machines and a versatile fleet of copiers for your Boca Raton business. If you are looking to upgrade the copiers in your Boca Raton business give one of our sales representatives a call and they will gladly assist in matching you with a line of copiers to fit your company’s day to day needs as well as your long term needs with one of our maintenance packages. Are you tired of dealing with large corporations with so many different departments that it can be hard to get anything accomplished? STAT Business Systems is a family company that is dedicated to customer service. Our major difference is that we offer some of the fastest service in the business from a qualified team of copier and printing experts. It’s one of the main reasons that we have been successful for over 31 years in the South Florida marketplace. Our customers stay with us long term because they understand the value in fast expert copier service from a company that cares about it’s clients. Business copiers Miami: Miami companies are always looking for a copier that is reliable and efficient. STAT can pair you up with a line of business copiers for your Miami company. If you are looking for a business black and white copier, a color copier, or perhaps a multi-function business copier for your Miami business, STAT has a variety of copiers that can do it all and they can also customize a package to fit your needs. Imagine how many headaches can be avoided when your business copiers are placed on a maintenance package. This makes the day to day operations of your Miami company seamless. We hate to say it but many copier businesses can be a bit shady in Florida. We dislike seeing companies who are tricked into long term tricky contracts for inferior products. Our approach is different! We focus on expert copier advice and workmanship and utilize programs that help your business (not hurt it). We offer a transparent pricing and contract model so that you are agreeing to a copier purchase or contact that you will actually understand. Copiers Pompano Beach: Pompano Beach is a city that is filled with festivities as well as culture and large support of local businesses. Residents of Pompano beach are able to enjoy annual events such as the Pompano Beach Holiday Boat Parade, St. Patrick’s Irish Festival, the Holiday Yuletide Parade and their most popular Annual Nautical Flea Market which is located in the Pompano Community Park and Amphitheater. Local Businesses in Pompano Beach not only enjoy beautiful Florida coastlines but also enjoy the reliability that comes with the service of a company like STAT Business Solutions for their copier needs. Pompano Beach businesses can rely that copiers from STAT are top of the line that can meet the demand of any business large or small.